Are Seagrass Meadows Wasting Away? Important habitat for many species, seagrasses are facing a threat. You never know what childhood experiences are going to stick. Growing up in south central Texas, Olivia Graham counts herself lucky to have spent a few weeks each summer poking around the intertidal zones of Puget Sound while visiting her grandparents. Clearly those experiences left an impression, as I found Graham telling me her story during a low tide on the BC Central Coast with a big smile, clad in rain gear, and slowly drawing seagrass through her fingers, one blade at a time. She’s looking for the telltale marks of disease. During a morning low tide in June, Graham, a doctoral student from Cornell University, leads five scientists under the pier at Hakai’s Calvert Island Ecological Observatory. They are checking if the disease is more prevalent higher in the intertidal zone compared to areas of the seagrass meadow that remain underwater. Graham quickly finds the symptomatic black band of the disease. Not new to scientists, the pathogenic single-celled organism called Labyrinthula zosterae [lab-EE-rin-thew-la ZAHS-ter-aye] decimated seagrass beds on the United States east coast and Europe during the 1930s. The organism consumes the seagrass’ chloroplasts. Without their chloroplasts, the seagrass cells lose their photosynthetic powerhouses and die. The dead tissue turns tan or white and loses strength as the active black infection spreads. Waves or grazing herbivores may then break off the top portions of the grass, like thinning shears during a haircut. 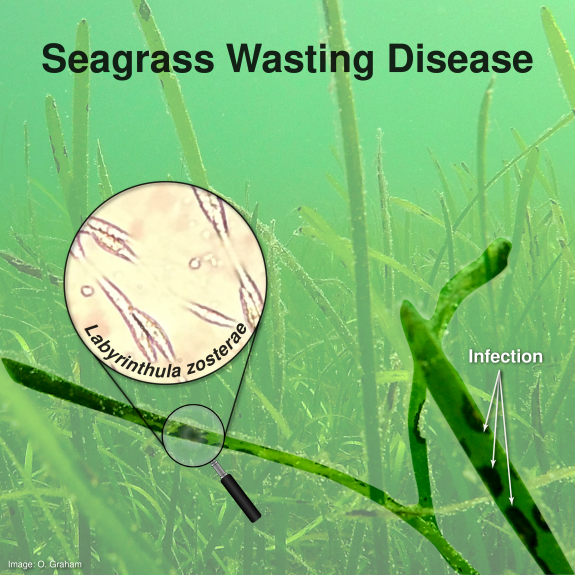 “Seagrass wasting disease is one of a handful of contributors leading to declines in seagrass productivity worldwide,” says Graham. Lost productivity affects more than just the seagrass. Meadows provide important habitat for juvenile salmon, herring, and countless other species. They also prevent shoreline erosion and filter excess nutrients from the nearshore environment. The loss of these services through the spread of disease has repercussions throughout the ecosystem. Currently, the only known method of disease transmission is through direct contact between blades, but Graham’s lab members, led by Drew Harvell at Cornell University, are trying to figure out if the pathogen might be able to spread through the water. Transmission through the water seems likely, as the disease has been confirmed from Washington to Alaska. Collaborators on the project have surveys planned to check seagrass meadows in Oregon and California next year, but Graham notes that she has yet to find a meadow that is not impacted to some extent. While the pervasiveness of the disease sounds alarming, and with good reason, there is quite a range between sites. Seagrass meadows around Seattle and central Puget Sound have the disease present in up to 80 percent of the surveyed areas, but on Calvert Island, it is only found in 20 percent. The disease prevalence may be tied to humans. Since the Harvell Lab researchers began monitoring of seagrass beds in 2010, they have made the connection between increased prevalence of the disease and warmer waters. This is concerning information in an ocean region that recently experienced a significant marine heatwave that continues to plague coastal estuaries. With climate change warming marine waters globally the pressure is on to determine what other factors, from seagrass genetics to invertebrate predation, are also contributing to the spread of the pathogen. It’s fitting that Graham has such an infectious passion for her research. Her desire to understand the intertidal stems from those childhood days where she was crouched on the beach poking around the rocks and algae. While she’s grown up, and the questions have matured, you can still hear her childlike excitement at new findings.